On Chicago's North Side, the Music Box Theatre serves up art-house cinema, live organ music, and horror film fests with guests like George Romero. Nearby, the romantic old Riviera Theater and Aragon Ballroom showcase the likes of Wilco and the Flaming Lips. 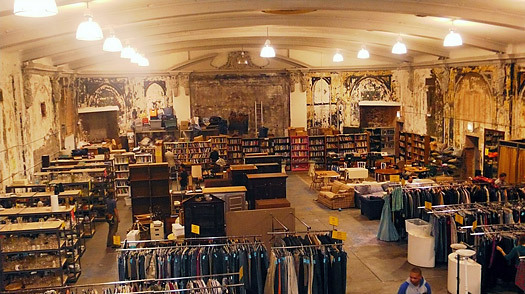 But the 1920s-era Calo Theater in Andersonville doesn't show movies or host live performances anymore: The huge space  with its vaulted ceiling, sloping tiled entryway, beautifully tattered walls and decorative moldings  now boasts the secondhand wares of the Brown Elephant Resale Shop, whose proceeds go to AIDS research and providing medical services within the gay community. This makes it one of the neatest shopping locales in the city  plus it has a higher-quality selection than other consignment shops, including, say, a wallet (for $5) from the Andy Warhol clothing-and-accessories line and vintage Dunhill lighters. If you're not a thrift-store junkie, grab an old copy of Life magazine from the '60s or perhaps A Legal Guide for Lesbian and Gay Couples and plop down on one of the nearby couches  they're the best seats in the house.